50% Off Spring Collection At Justice For Girls! Check out this great sale for awesome trendy styles for girls this season! 50% Off Spring Collection At Justice For Girls! Shirts, shorts, tees, tanks and dresses all on sale at great prices! Head over and shop this great sale at Justice For Girls today! 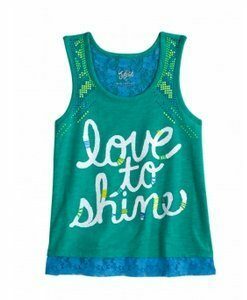 50% Off Sale At Justice For Girls As Low As $3.98! Don’t miss it! This is a HUGE event just in time for Spring & Summer fashions restock! Head over to the 50% Off Sale At Justice For Girls As Low As $3.98! Tons of clothes to choose from! Shorts, Skirts, Dresses, Tanks, Tees and accessories all on sale! This is the perfect time to grab great Spring & Summer essentials! Shop for the best trendy fashion deals at Justice for Girls every day!